Now let’s get this brand new Amiga computer assembled. The X1000 is based on Fractal Design’s Define R3 case with a couple of cosmetic changes described below. The front panel has been etched with a nice boing ball pattern. There is also a raised case sticker on the bottom. The less obvious change is the blue LED has been exchanged for a red one to nicely match the red motherboard. 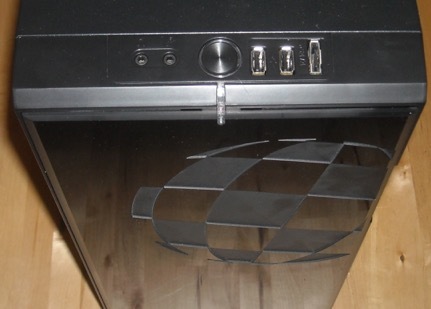 On the top of the case there is easy access to a couple of USB ports and an eSATA port. 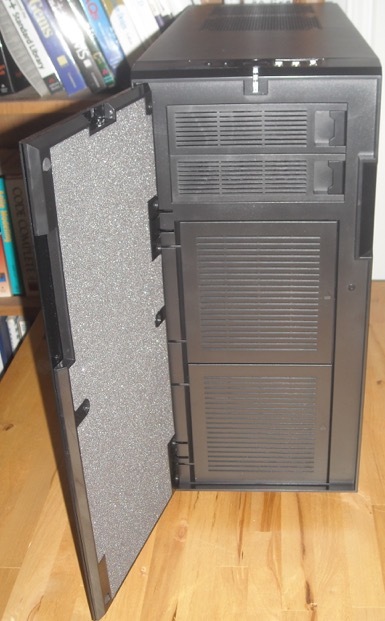 The front panel opens to reveal the drive bay covers and space for two 5 1/4” drives. There is also a tiny reset button on the right side about half way down. First to go in is the power supply. A high quality 600 W or higher power supply is currently recommended so I went for the minimum. The graphics card states it needs at least a 400 W power supply alone. I installed the SATA DVD drive next which is a simple Samsung OEM drive I’ve used successfully with my other AmigaOS systems including the Sam440ep-flex and Sam460ex. The SATA hard drives were next. 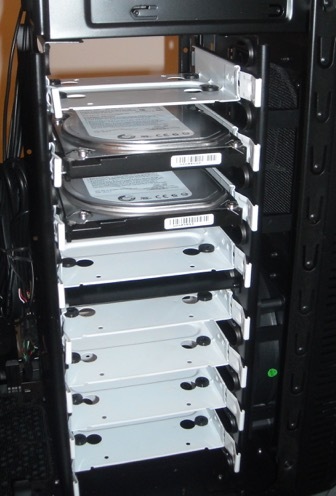 I decided on a couple of 500 GB Seagate drives and installed them into the upper drive bays initially. 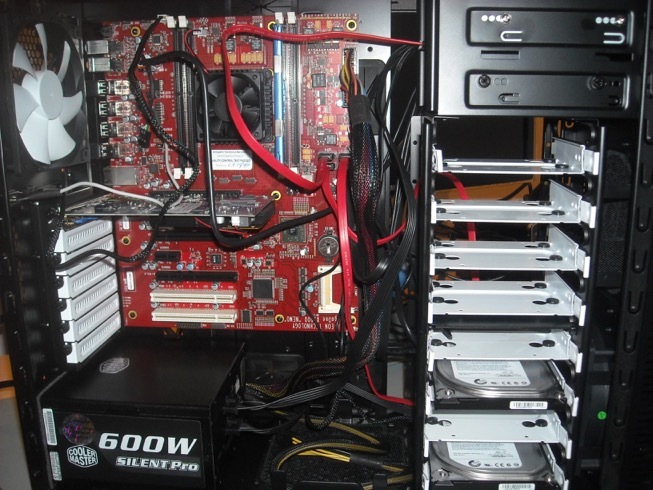 Notice all the room for plenty more drives and there is a fan on the right hand side which keeps things cool. An extra fan can be installed if you have more drives. Later on I decided to move the drives to the bottom of the case which is no problem with those white tabbed brackets. Next up was the motherboard itself which is what all this fuss is about. Apologies for the poor camera work but I’m no photographer. Note that all work was done on a properly grounded antistatic mat which has that funny blue colour to it. I have a wrist strap which plugs into the mat as well. 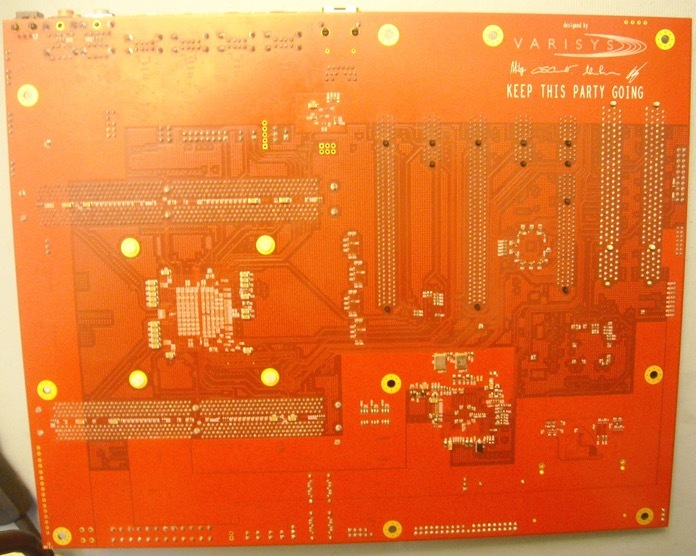 This unique board was commissioned by A-EON Technology CVBA which is a company created for this purpose. 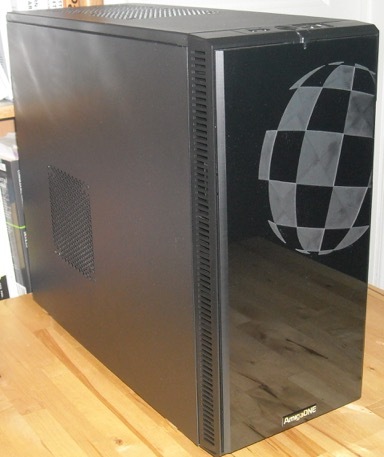 It is hoped A-EON will continue to create many more AmigaOne products in the future. 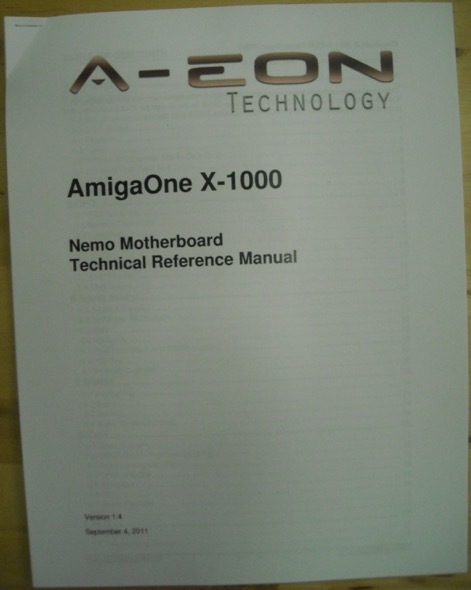 Nemo is the code name for this board which was developed by Varisys Ltd.
AmigaKit is the sole distributer for the AmigaOne X1000 and has been providing boards to the beta testing team. They have been testing each and every board they ship. Part of what makes this Amiga computer system special is the inclusion of Xena. 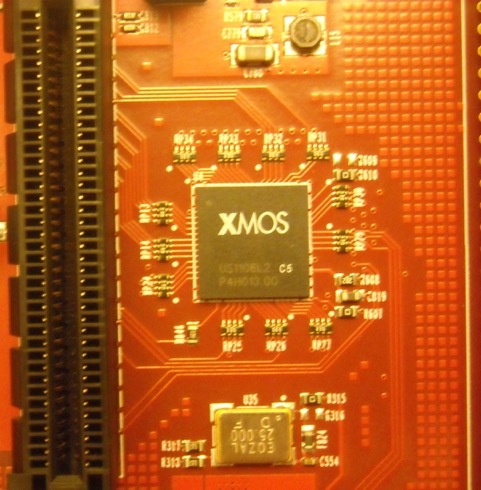 Xena is an XMOS XS1-L2 chip directly on the motherboard. This chip is directly tied to the CPU, PLD and the Xorro slot which is pictured to the left below. The Xorro slot is physically a PCI Express x8 card edge connector but it is not compatible with PCI Express x8 cards. More details on Xena and Xorro are included with the technical reference manual which is not yet publicly available. 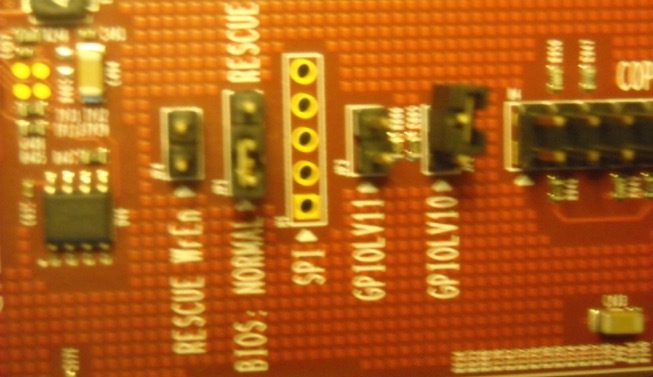 The next couple of pictures show the connectors on the back of the board. There are plenty of USB ports and a gigabit ethernet port along with some audio options. 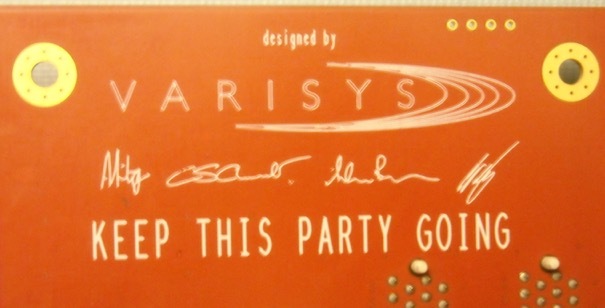 On the bottom of the board is the obligatory signatures of the designers. Here is a shot of the entire bottom of the board. With two memory controllers two really is better than one with the X1000. Preliminary test results with dual DDR2 memory sticks are quite favourable. These memory controllers are not fussy either and do not require custom memory as did the older discontinued Eyetech AmigaOne and MicroA1 boards. 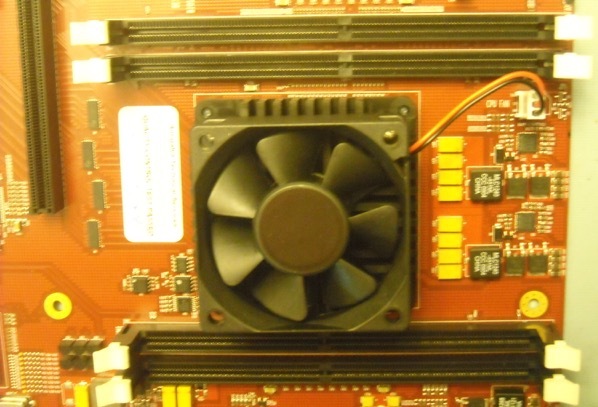 The X1000 supports 1.8V DDR2-800, unbuffered, non-ECC, DIMMs. The maximum amount of memory supported by the hardware is 16 GB. AmigaOS itself currently has a limit of 2 GB. The CPU is hiding under the heat sink and fan. It is the truly unique PA Semi PWRficient PA6T-1682M. This CPU has dual 1.8 GHz PowerPC cores with 2 MB L2 cache. It includes a double precision FPU and an AltiVec unit. With 24 SerDes channels this is truly an I/O powerhouse as well. Two PCIe x16 slots support single or dual PCIe graphics cards. 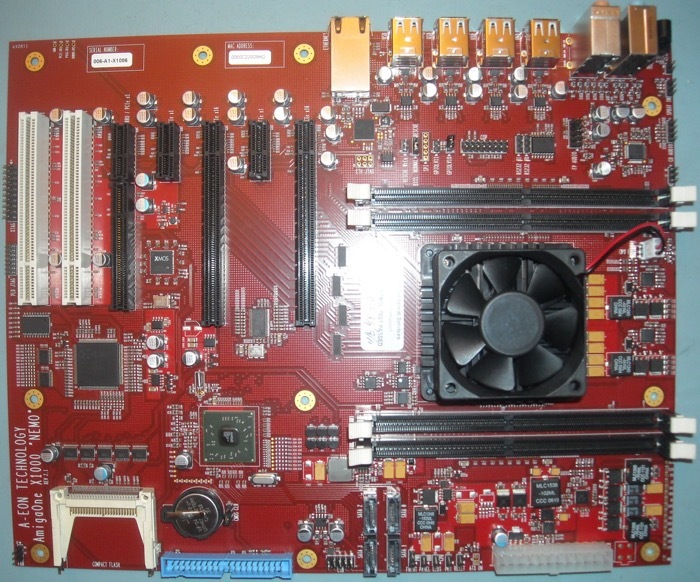 Three PCIe x1 slots are provided as well as two 32bit 33MHz PCI 5V slots for plenty of expansion options. 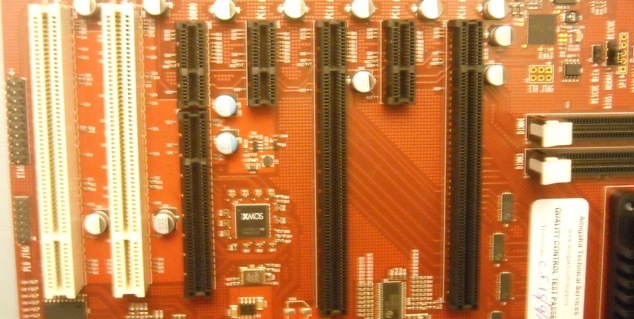 Note one PCIe x1 slot is inline with the Xorro slot. 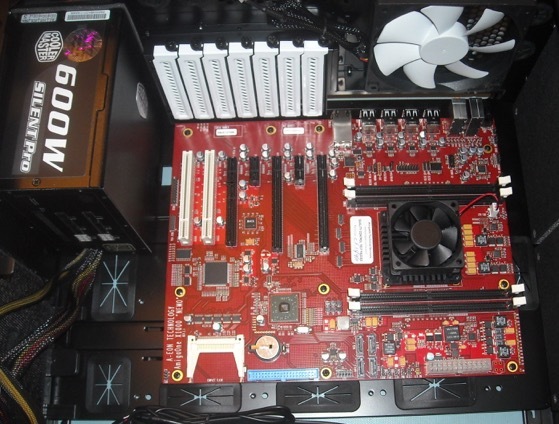 PATA and SATA connectors on the board are provided via the AMD SB600 south bridge. The following picture is a bit fuzzy but what I’m trying to highlight is the rescue BIOS. Updating firmware is always dangerous so the designers have provided dual serial flash EEPROM chips. The rescue BIOS is always available in case something ever goes wrong during a firmware update. A couple of serial ports are provided primarily for debugging purposes these days. I have connected serial port 0 to my Sam440ep-flex system to capture debug logs. Audio fans have not been forgotten with a CD audio and SPDIF input on the board. I would also like to point out there are no less than two extra fan connectors on the board which is a nice bonus. It is now time to get this board installed into its special case. Here it is installed with nothing connected yet. Here it is after connecting up everything. I tossed in a Radeon 4650 1 GB graphics card which works nicely with AmigaOS. Here is a shot of me installing AmigaOS for the first time via a CD ISO image. No Amiga computer system would be complete without a proper keyboard and mouse to go with it. Besides the obvious raised sticker, the keyboard also features a Help key and boing ball command keys in their proper locations. Documentation for this beast is coming along. Being a beta tester I have access to the preliminary documentation of course. Here is a shot of some of the information provided. I now have my X1000 booting up into a bog standard AmigaOS 4.1 Update 3 configuration. The next step will be to load up the beta components as we work our way towards the final AmigaOS 4.2 release. It is quite snappy as you would expect but some drivers and features are not yet complete. If you would like to see this system up and running in person I suggest you attend AmiWest 2011 in Sacramento, California from October 21 to 23. I will be there with my X1000 and you can try it out for yourself. In the mean time, keep checking Hyperion’s development blog where progress on AmigaOS 4.2 will be posted. Disclaimer: All specifications and features are subject to change without notice. This is a beta board and things could still change.